An El Greco painting, one of several dozen from a collection of Old Masters previously belonging to a Viennese industrialist and seized by the Gestapo in Vienna in 1938, has been returned to the family of its former owner after a swift process of recovery, thanks to a cooperative dealer. The painting, “Portrait of a Gentleman,” was known to have been sold to a dealer in New York in the 1950s, but attempts to reach him proved unsuccessful and the work was able to change hands several times over the next 60 years, before resurfacing again for sale in New York, the institutions that helped facilitate the recovery said. Anne Webber, of the Commission for Looted Art in Europe, which represented the heirs of the former owner, Julius Priester, and put in a claim for the work said the case was as an example of the extent to which art traders have been involved in the disposal of works looted by the Nazis, and how swiftly they can be returned if those dealers are willing to cooperate. While governments and museums have faced the issue of the Nazis’ looting of art owned by Jews, art dealers and private collectors are not bound by the Washington Conference Principles on Nazi-Confiscated Art, signed by 45 countries in 1998. Even the existence of databases documenting looted works is of little use unless the parties possessing the works cooperate. Mr. Priester, who fled Vienna in 1938, ending up in Mexico City, began searching for the collection he had entrusted to the care of a friend immediately after the end of World War II. Before his death in 1954 he worked together with the Austrian authorities to try to recover works, relying on documentation and photographs of them. 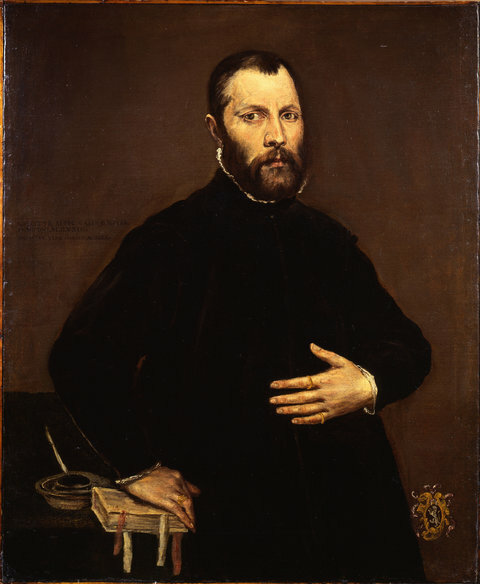 One image shows the El Greco portrait of a bearded man, leaning on a book with his left hand across his chest and a deep, reflective gaze, hanging above the sideboard in the formal dining room of the Priesters’ prewar home. It was returned to the family, in Britain, in the same frame as appeared in the picture, Ms. Webber said. In the case of the El Greco the dealer, who has not been identified, responded swiftly to the claim submitted by the commission and the process of recovery took only a matter of months, instead of years, as is often the case, Ms. Webber said. The dealer was given the opportunity to be named and to comment for a news release, but wished to remain anonymous because he has no desire for personal praise and is content knowing that he has done the right thing, his representatives said.